Amy asked me whether it truly is the case that “gluten-free” is not allowed in the ingredients list, and if this is the case, why some manufacturers provide this information regardless of the regulations. Hmmm and WOW! So gluten-free in the ingredients list “could be considered intervening material” BUT will FDA really deem products misbranded based on this language alone?? I do not want to interpret FDA’s statement for manufacturers but it is the case that this “potential” violation should be filed under RIDICULOUS. Specially produced gluten-free oats are not the same as regular oats and the only way to make a distinction between “regular” oats and “gluten-free” oats in a multi-ingredient product is to allow the use of “gluten-free” in the ingredients list. IF I was a manufacturer, I would take my chances on this one for the good of the consumer. AND this is one labeling “violation” that Gluten Free Watchdog will NOT be reporting to the FDA. You may have noticed that oats used in single-ingredient and multi-ingredient gluten-free products are included in the ingredients list under a variety of “names”—oats, gluten-free oats, certified oats, and pure oats (for products sold in Canada). This varying nomenclature can be very confusing, especially if you have been advised to eat only those oats that have been specially produced to be free of contamination from wheat, barley, and rye. The writing of this article is motivated by the seemingly increased use of oats that are neither gluten-free nor certified in multi-ingredient labeled gluten-free foods. Regardless of how a final food tests, this is a risky practice in the opinion of the authors. I asked Canadian dietitians Beth Armour and Shelley Case for their assistance in writing this article. Beth is also the co-owner of Cream Hill Estates, a supplier of GFCO certified gluten-free oats. NOTE: We are writing this article for consumers and manufacturers in the US and Canada. Products sold in Canada containing oats can NOT be labeled gluten-free. Extra verbiage has been included throughout the article to help make this clear. Why the general concern over oats? Manufacturers and consumers new to the gluten-free diet may not be aware of why it is so important to source/buy oats that are labeled gluten-free or certified gluten-free (or free of wheat, rye, and barley in Canada). Oats are highly likely to be contaminated with a gluten-containing grain when they arrive at a mill. Oats are frequently grown in rotation with or next to wheat or barley (and even rye). There will likely be some foreign grain growing in the oat field which will be harvested along with the oats. Oats also may become contaminated during harvest due to the use of shared harvesting equipment and grain holding bins, as well as during transport due to the use of non-dedicated railcars, trailers, trucks, etc. Even though oats are cleaned when they arrive at the mill, they will likely contain some foreign grain. Cross-contact with gluten-containing grains may be more of an issue with oats than with other naturally gluten-free grains and seeds because oats are similar to gluten-containing grains in size, shape and color. Additionally, in the US and Canada, grain standards for oats allow for contamination with foreign grain, including from wheat, barley, rye, and triticale. This foreign grain is not included in the ingredients list. We know from a study published in 2004 that “regular” oats available in the US market can not be considered gluten-free. 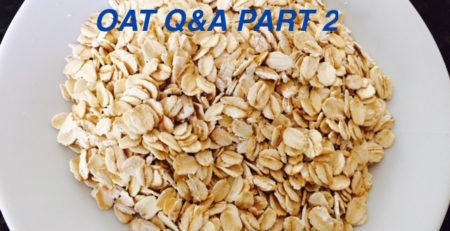 Based on testing four different lots of three brands of oats, it is clear that oat contamination varies tremendously between brands and between lots of the same brand. There also may be a great deal of variation within the same lot, especially if the lots are large. Gluten Free Watchdog has tested a number of gluten-free and certified gluten-free oats and oat containing products. The two products testing at or above 20 parts per million (ppm) of gluten did not appear to be using either gluten-free or certified gluten-free oats in their product. In the US single-ingredient oat products and multi-ingredient products containing oats may be labeled gluten-free as long as the final food product contains less than 20 ppm gluten (and meets the other criteria of the FDA’s gluten-free labeling rule). Single-ingredient oat products do not have to be certified gluten-free to be labeled gluten-free and oats used in multi-ingredient products do not have to be either gluten-free or certified gluten-free. This is the same criterion for all naturally gluten-free grains (eg, millet, sorghum, buckwheat) sold in the US. Canada is a major producer of oats for the North American and international markets. Farmers frequently grow a variety of grain crops including wheat, rye, barley and oats. Cross-contact of oats with the gluten-containing grains wheat, rye and barley is virtually guaranteed because of crop rotation in the fields, using contaminated seeds for planting and use of shared equipment for seeding, harvesting and transporting the grains. The Canadian gluten-free regulation does not allow pure, uncontaminated oats to be labeled “gluten-free.” Companies can make a claim stating they are free of wheat, rye and barley. Since 2007, Health Canada has had a position paper on the safety of pure oats for those with celiac disease: http://www.hc-sc.gc.ca/fn-an/securit/allerg/cel-coe/oats_cd-avoine-eng.php. The Canadian Celiac Association also has a position statement on oats in the gluten-free diet: http://www.celiac.ca/b/?page_id=858. Health Canada is currently reviewing the labeling of pure oats and gluten-free claims. It is hoped that regulatory changes will occur so that producers of pure, uncontaminated oats, as well as companies who use these oats in their gluten-free products, can label their products “gluten-free”. This would make it much easier for Canadian consumers to identify which oats are gluten-free. 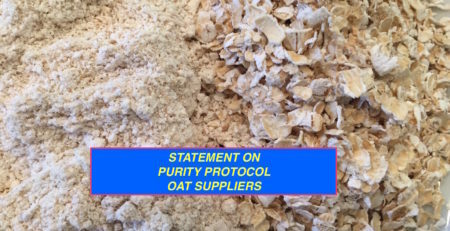 Example of a purity protocol The following protocol is provided to help explain the steps taken by suppliers of specially produced gluten-free oats to make sure that the oats are “safe” for people with celiac disease. 1. Our crop is inspected. After sowing pure oat seed, the Canadian Food Inspection Agency (CFIA) does a one time inspection of our crop in the field and reports on crop purity and on the presence/absence of any contaminating crops. The seed grower constantly inspects the crop and removes any foreign plants found as well. 2. Seed from the harvested crop is analyzed for purity in two steps. After harvesting, samples are sent to a federally-certified seed lab where a trained technician examines every single seed in over 15 kilograms of sample – that’s over 600,000 seeds! All foreign seeds, whether they be crop or weed seeds, are removed from the oats and identified as to the specific type of seed – wheat, barley, rye, canola, corn, weed, etc. The technician reports to us on the type and number of foreign seeds per kilogram. If there is more than one wheat, barley, rye, triticale, kamut, spelt or other type of wheat seed per kilogram, we do not use those oats. After cleaning by the seed grower, and before delivery to the processing mill, samples from each 1-tonne bag of our seed are again sent to the certified seed lab where the technician goes through the same process described in step one. If any sample from a 1-tonne bag contains any wheat, barley, rye, triticale, kamut, spelt or type of wheat seed closely related to wheat, that bag is not sent to the processing mill. 3. Our miller uses dedicated and/or thoroughly cleaned equipment. The equipment that processes the oats into flakes and flour is used only for oats and/or it is thoroughly cleaned and inspected to ensure there are no contaminating seeds present before it is used for pure oats. After processing, the oats are sampled at the mill, and the samples are sent to a certified biochemical testing lab in Burlington, Vermont, USA. There, the highly sensitive and internationally recognized R5 ELISA test: R-7001 shows whether, and if so, how much, gluten is in the finished products. This test is 10 times more sensitive than commonly used gluten detection tests. Our oats consistently test below or near the test’s lower limit of quantitation, which is five (5) parts per million. If you want to make sure you are eating only those oats specially produced to be gluten-free or certified gluten-free it is important to check package labeling and the ingredients list carefully. If a company is paying premium price for gluten-free oats then they probably will be indicating this in the ingredients list by specifying gluten-free oats (US). If they are using certified gluten-free oats for their gluten-free product then they probably will be specifying certified gluten-free oats in the ingredients list (US). In Canada the product would likely be labeled wheat-free and the oats used should be specified as pure with an explanation somewhere on the label that they do not contain wheat, barley or rye. If a multi-ingredient product labeled gluten-free in the US lists the oat ingredient without the qualifiers “gluten-free” or “certified gluten-free” the oat ingredient may not have been specially produced to be free of cross-contact with wheat, barley, and rye or adhered to a special purity protocol. The following table provides some of the ingredient wording options that a consumer may see in the ingredients list of a single-ingredient or multi-ingredient product containing oats that is labeled gluten-free in the US or wheat-free and pure in Canada. Please note: Products sold in Canada containing oats can NOT be labeled gluten-free or certified gluten-free. Note to manufacturers: These are NOT the country specific labeling regulations. This table is meant to show consumers what they may see on product packaging. “Oats” US and Canada Less than 20 ppm Product packaging must clearly indicate the product is gluten-free (US) or made with pure, uncontaminated oats (Canada) or describe the oats as not containing any wheat, rye, or barley (Canada). Certified gluten-free oats US No more than 10 ppm The oats used in the product must meet the ppm levels defined by the certifying organization. Oats can not be labeled “gluten-free” or “certified gluten-free” in Canada. It is important to remember that under the FDA gluten-free labeling rule, foods labeled gluten-free are not required to be tested for gluten contamination. It is hoped that manufacturers of all labeled gluten-free foods test their products. If you eat gluten-free oats, it is important to realize that there are risks in consuming multi-ingredient gluten-free products when companies use regular commercial oats and oat flour and not gluten-free oats and gluten-free oat flour. One sample of a gluten-free oat product within a lot number may test at less than 20ppm and another sample within that same lot number may test at 20 or more ppm gluten. This reality is due to the inconsistencies in the purity of regular commercial oats. A critical issue in any discussion about testing is how companies are sampling products for gluten contamination. This is particularly important when it comes to oats that have not been grown following a specific purity protocol. For example cross-contact from gluten containing grains does not happen evenly throughout the field and therefore once harvested there can be “pockets” of gluten-containing grains (eg, wheat, rye and barley) in the oats. If the oat sample for gluten testing is only taken from the top of an oat container the “pocket” of contamination may be missed. If multiple samples are taken from various places in the oat container there is a better chance of getting a sample from the “pocket” of contamination and determining that there is indeed contamination in the oats. Due to the nature of contamination (ie, not evenly distributed throughout a lot number), there is a significant risk of cross-contact with wheat, barley, or rye in gluten-free products that have used regular commercial oats even if each lot number of raw oats or finished product containing oats is tested. Bottom line for consumers: Eat only single-ingredient oat products that are labeled gluten-free or certified gluten-free (if you are in Canada eat only those oats labeled wheat-free or free of wheat, rye and barley). Eat only those multi-ingredient products containing oats that list gluten-free oats or certified gluten-free oats in the ingredients list (if you are in Canada eat only those multi-ingredient oat products containing oats that list pure oats in the ingredients list or clearly explains on the package that the oats do not contain any wheat, barley, or rye). Bottom line for manufacturers of gluten-free foods: Use only gluten-free, certified gluten-free (or in Canada pure, uncontaminated) oats in your labeled gluten-free foods. To avoid consumer confusion “name” the oat ingredient appropriately in the ingredients list. Bob’s Red Mill; also sells to manufacturers of multi-ingredient products containing oats. © Copyright May 21, 2014 by Gluten Free Watchdog. All Rights Reserved. FDA not only can fine the the companies for such violation but can deny the goods to be imported to the US. In addition, after so many violations they could ban the product coming in to the US from that manufacturer. When being imported to the US it’s a much bigger risk than they could ever take or should ever take. Hi Tonia, Under the FDA’s gluten-free labeling rule oats used in labeled gluten-free foods are not required to be purity protocol oats. The final food product must contain under 20 parts per million of gluten. If the FDA investigates consumer complaints related to a food product (as was the case with Cheerios), the Agency can “force” a “voluntary” recall if the product tests at/above 20 parts per million of gluten. You write that certified GF oats can contain no more than 10 ppm of gluten, but 2 of the 4 certifying bodies in the US allow for more than 10 ppm. Beyond Celiac Gluten-Free Certification Program allows for 20ppm, and National Sanitation Foundation allows for 15ppm. Do they have different standards for oats?